Washington, Missouri is a small town about 50 miles west of St. Louis. In the 1930’s, many large Catholic families called Washington home. Among them were the Wildts. Laverne Wildt was one of eight children born to Catherine and Herman Wildt. Their children were great playmates and friends to each other--always under the watchful eyes and loving care of their parents. Laverne and her siblings attended the St. Francis Borgia Grade School in Washington. This provided the first contact with women religious for the youngsters. During the summer, Laverne spent many happy days visiting her grandparents who lived on a farm in Neier, Missouri about 50 miles away. She enjoyed the freedom of the farm, watching the crops grow, helping care for the livestock, and learning to fish! Her parents wanted the children to attend the St. Francis Borgia High School but in this post-depression era, finances were tight. Each of the Wildt children had to find a job to help with the cost of their Catholic high school education. So during the eighth grade, Laverne began to work at St. Francis Hospital. It was while working in this environment that she first met the Hospital Sisters of St. Francis. While working at the hospital, the Sisters took some of the young girls working there, including Laverne, to Springfield to visit the Motherhouse. After this visit, she began to consider religious life. What most impressed young Laverne was that the Hospital Sisters were full of fun, very human women who had both good and bad days. This helped Laverne realize that she did not need to be a saint to enter the Community. After thinking about this and praying over it for some time, she told her parents that she wanted to enter the Community. Her mother was very upset about the news, but Dad replied, "Let her go; she will be back in a couple of weeks. She is not cut out to be a nun!" On February 1, 1947, Laverne journeyed to Springfield to begin her life as a Hospital Sister of St. Francis. After eight months, she entered the Novitiate and became known as Sister Kenneth. She asked for this name because of a little brother whom she adored named Kenneth. When she completed her novitiate, Sister Kenneth professed her religious vows on October 4, 1949. Soon she began to study at St. John’s School of Nursing and graduated in 1953. Sister Kenneth has ministered in a variety of settings. Her career includes hospital nursing in the areas of Pediatrics, Psychiatry, and Emergency as well as general medical and surgical nursing. She has also worked on the Navajo Indian Reservation and with Public Health Service and later in a clothing store in Chinle, Arizona. For the past ten years, Sister Kenneth has lived in Highland, Illinois and served at St. Joseph’s Hospital there. 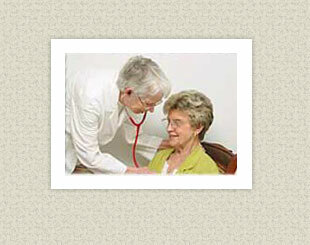 Most of that time, she has cared for the sick in their homes through the Home Health Department at the hospital. Now she is working in the Outpatient Surgery Department. She enjoys this interaction with patients and their families. It seems that Dad’s instincts were wrong when he said Laverne would "be back in a couple of weeks" and wasn’t cut out to be a nun. Sister Kenneth has been a Hospital Sister of St. Francis for over fifty years and continues to minister to all of God’s people!